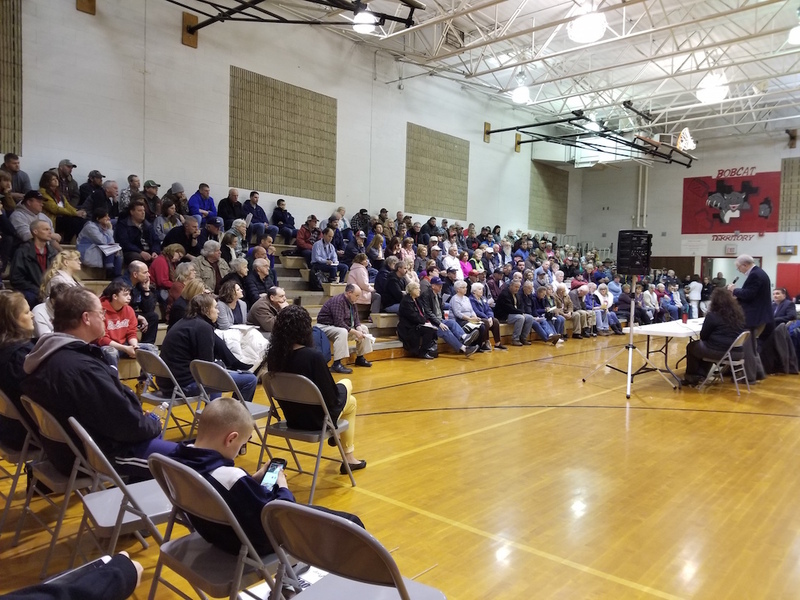 CRESTON, Ohio — Local residents packed a former middle school gymnasium March 14 to air concerns over plans to build a 10 million gallon waste storage lagoon between Wooster and the village of Creston. The town hall meeting was organized by the Canaan Residents Against Pollution, and included farmers and nonfarmers, as well as local government leaders. Known as the Wiles Storage Pond, the earthen-lined storage structure would hold both anaerobically digested biosolids and up to 300,000 gallons of hog manure annually from the landowner’s hog farm, according to permit applications filed with the Ohio EPA. The developer, Quasar Energy Group, plans to construct the lagoon on land it is leasing from Wayne County farmer Jason Wiles. 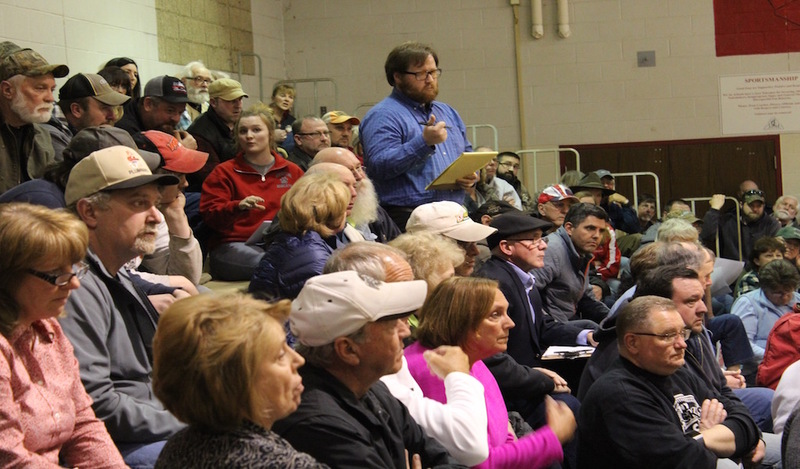 The Ohio EPA has scheduled a public hearing on the lagoon April 17, at 6 p.m. at Fisher Auditorium on the Wooster campus of the Ohio Agricultural Research and Development Center. The developer says the processed waste will provide an organic source of fertilizer, but residents, including some farmers, say there are concerns about odor, environmental impact, noise, and where exactly the material will originate. The company plans to use processed waste from its energy-producing digester located on the Wooster campus of Ohio State University, but would not disclose which sources or cities supply the digester, citing confidentiality agreements with customers. At the March 14 meeting, Wayne County Engineer Scott Miller said, like residents, he’s concerned about how the roads will be used. Miller said he recently met with Quasar’s public relations coordinator, who told Miller the company planned to install the lagoon by July. 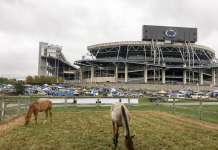 “They’re definitely trying to shove this in as quick as possible and we warned them that that’s not a good idea when you’re trying to put something of that nature in the backyards of so many people,” Miller said. According to Miller, his office is working through the county commissioners to enforce a road-use maintenance agreement similar to what is used with petroleum pipeline projects being constructed in the county. He said the agreement would determine the location of where the product will be transported, identify the subcontractors, and require a $250,000 bond per mile, to protect against damages. Quasar said its operation will only require two to three trucks per day, with slight increases during application season. Miller said bore testing would need to be done to determine the weight limits for the roads, and it would be up to the company to either improve the roads they intend to use, or haul smaller loads. Miller said the company disclosed a plan to pipe the material within a two- to five-mile radius. A manure applicator at the meeting who is not affiliated with the project said the piping system is part of the reason fewer trucks would be needed. Sam Carmony, whose family operates a custom manure application business called Carmony Stock Farms, said the pipelines allow the applicators to use a process of “continuous flow,” so manure can be applied without using as much trucking. Carmony said he works with livestock and municipal waste on a regular basis and believes it’s a safe product. He said he’s not part of the lagoon project, but as an area applicator, he could possibly apply waste from it, if installed. But his time with the microphone was limited, as residents continued to raise concerns. The biggest concern was that this lagoon would store municipal waste and processed sewage. Quasar has previously said the material entering its digester contains less than 20 percent biosolids. 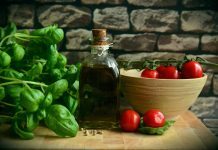 But farmers at the meeting, who declined to be named, said the county already has an abundance of organic fertilizer from its livestock and dairy farms. 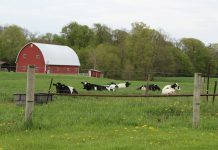 Wayne County leads the state in total number of dairy cows, and is among the top in livestock production. Dan Armstrong, a local resident who said his family has lived in the township for more than 200 years, said the biggest problem was the way residents learned about the project — from each other and not from the developer. “It’s their PR that got them in a lot of trouble,” Armstrong said. Barb Kinney, a Realtor with Gray Estates, said a structure of this kind “has a negative environmental stigma” that could result in a 15 to 30 percent reduction in property values within a mile, and 5 to 10 percent reduction within 1 to 2 miles of the project. Brandon Mantel, president of the Akron-based water treatment and testing company known as Donamarc Water Systems, told landowners to consider getting pre-construction well tests, so they have comparable data if an issue arises. Most of the people at the meeting indicated by a round of applause that they do not want the lagoon built. But other speakers tried to prepare the residents for all outcomes. Dave Bell, an environmental lawyer representing the local citizens group, said the U.S. and Ohio EPA have provisions that allow for biosolids management and permitting, and that without local zoning, the project may be difficult to stop. “It is really rare for an (government) agency to simply refuse a permit because people don’t want it,” Bell said. Next articleIs 'uncured' corned beef really uncured?